Liebliche Fee, surft auf Glimmerfischen über die Wellen. Surfer's Dream. Riding the perfect wave is every surfer's dream, and this fairy is no different. 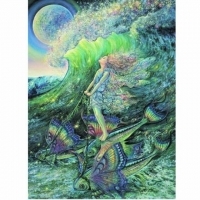 As she glides across a cosmic wave upon her flying fish, she is carried into a world of magic and pure joy. Within her wave there exists her own personal galaxy, with a myriad of stars to light her way to the realization of her most heartfelt dreams. Innen rechts steht: May you be carried on a starry sea to wherever you most wish to be, where magic flows on waves of light and your dreams shine bright like the moon at night.